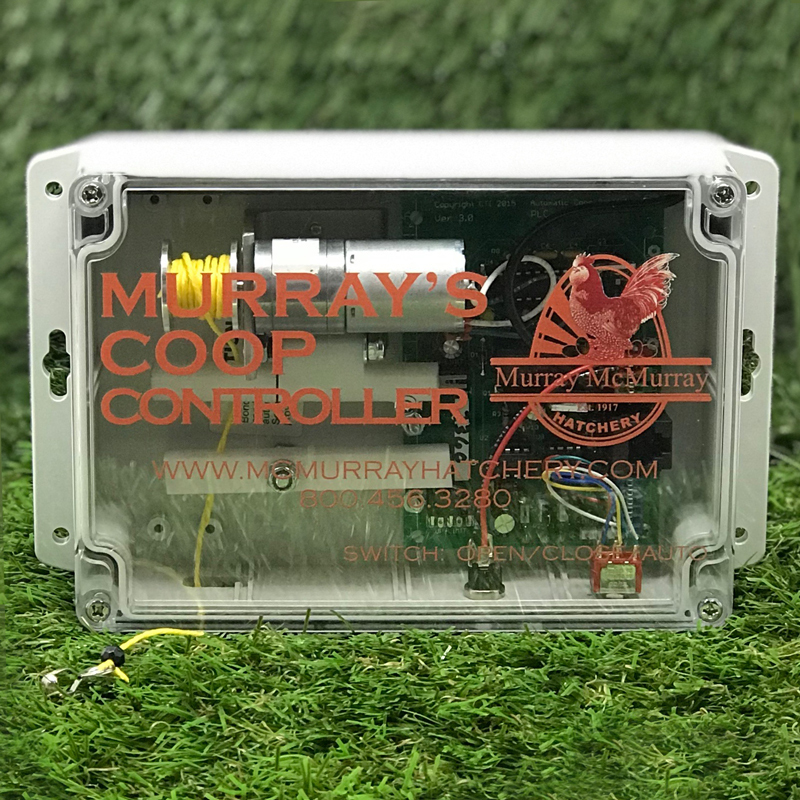 McMurray's Coop Controller automatically opens the chicken coop door in the morning and close the coop door at night. An integrated light in the controller ensures that your chickens have 16 hours of light per day for increased egg production. The controller senses the sunrise and sunset to control the door position, and includes a built-in temperature sensor that will only open the door if the outside temperature is above 20 degrees (F) protecting chickens on cold winter mornings. Opens door at sunrise if the temperature is above 20 degrees (F). Shuts door at sunset, protecting your flock from predators and weather. Built-in supplemental light ensures chickens have plenty of light for egg production. Complete door controller kit includes: the controller unit, AC adapter, sensor, 12" x 12" roost-proof door, door rails, and installation instructions. Sensor units available in 6-foot or 12-foot lengths. Quick and simple installation with no programming required. Coop Door Dimensions: 12" x 12"
NOTE: Previous versions of McMurray's Coop Controller have a different plug-in for the sensor. When ordering a new control box, or new sensor, please communicate your sensor plug-in type. When does the light come on? The light comes on 8 hours after sunset. Can the controller be operated on a timer rather than the light sensor? Can it be mounted on the outside of the coop? How do you keep bedding and droppings from piling up below the door and preventing it from closing? Without the light sensor, the controller will not function properly and will default to night mode, keeping the door closed. The unit should be mounted on the inside of your coop for protection from outdoor elements. The door should be positioned about 3.5 inches from the floor when closed. If bedding starts piling up under the door, just sweep it away. Can the outdoor temperature of 20 degrees (F) on the coop door controller be adjusted up or down? No, but you can bypass the cold weather sensor if you want the door to open when temperature is lower. Reference#5cdbl battery cable, what battery voltage do we need to run the coop controller in case of power failure? You can use a 12 V car battery to power your coop controller. Is catalog number 5MCC the whole kit? Yes. It includes the door, door rails, light panel, controller, sensor, and installation instructions. Can you list the especific items necesary to install the automatic door for the chicken coop? The photo shows everything that comes with the complete unit. If you click on the instructions, it will list each part that is included. Does your chicken door have a warranty? If it is below 20 degrees at sunrise, will the door open later in the day when it warms up? Thank you Stephen. 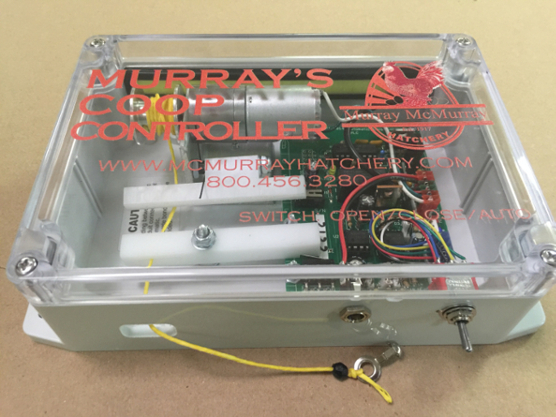 We have a 1 year warranty on the coop controller. The door will open when the temp rises above 20 degrees. After one year of working fine, the controller has stopped. The green led in the box is very faint or off completely. I can spray cold air on the board and the led will get bright and the door works, but it only lasts for an hour to two. Can the board be replaced without buying the entire controller? Try checking your power supply by plugging it into your LED light panel. If the green light is faint, your unit may not be getting enough power. What size should the rough opening be for installation of the door? How much clearance is needed above and on the sides of the door? Thanks. The opening in your wall should be approximately 11" x 11" and 4 inches above the floor. If you download the instructions there are photos to show all the dimensions for installation. We do not currently have a solar option but we offer a battery lead to connect it to a 12v car battery instead of plugging into an outlet. We have had customers successfully run their unit with a battery charged by solar power. Is the door secure when closed? We have predators like racoons and skunks. The racoons can figure out how to open anything. The door is not secured when shut because it slides up and down between 2 metal rails. But we have not had any reports of preditors being able to get in the coop. I am an electrical contractor and I have a customer who would like to power this coop controller with solar power. For sizing purposes, I need to know what the power consumption is. If unknown, can you tell me what the output of the plug-in transformer is? 500ma?, 1000ma? The power supply we send with our controllers is 12V-1000mA. Make sure the sensor is plugged in correctly on the circuit board. It will cover 4 small pins, if one of them is not covered it will not function properly. We got the automatic door opener the first part of June. It has worked fine until this morning and it did not open. We are both having surgery Monday and we are counting on the door. Can you trouble shoot for us. I have unplugged everything and plug it back in. Still does nothing, lights are on in controller. Check your controller to be sure the yellow cord is routed properly. There is a photo on page 7 of the instructions. Also be sure the connectors are covering all the correct pins. If any of the pins are not covered the door will not function. There is no way to automatically set a time to open and close with our door. It uses a light sensor that will open in the morning with daylight and close shortly after sunset. A LifesaverI can't say enough good things about having an automatic coop door, it gives peace of mind not having to schedule my life around "shutting up the girls". Our urban location includes cats, dogs, raccoons and coyotes, any of which would make a meal if they could - with the automatic coop door we haven't lost a hen yet. We can even take an overnight trip without contracting someone to check the girls in the evening. Not for the PNW!This product seemed so perfect, but I cannot get it to work well for me. After installing correctly and switching the light sensor to allow the door to close as late as possible, it still locks chickens out of the coop every night. I am in the Pacific northwest, so rainy/overcast days are the rule, not the exception, so the sensor must think the sun has gone down earlier than it really is. Also, egg production dropped when I was just using the light on the controller instead of my overhead light, so now I am using both and they are laying well again. I bought this to make life easier for my chicken-sitter when I go out of town, and also so that I can go out in the evening without worrying about the chickens. It does reduce the work for my chicken sitter, because she won't have to come over in the morning to let the chickens out. However, I am still having to go out twice each evening: once to collect eggs and get the chickens in the coop that didn't make it in before the door closed, and a second time to go turn off the interior light. I have decided to keep it, even though I feel like it is incredibly overpriced for how poorly it works in my region. If the light was brighter and the chickens made it in safely before the door closed I would give it 5 stars. The idea is right, but it needs a couple of tweaks to work properly in the PNW.